Waterford County Museum: Saturday, April 30 Waterford Men in the 1916 Rising in Dublin. Saturday, April 30 Waterford Men in the 1916 Rising in Dublin. There is no entry fee and all are very welcome. Pat McCarthy is now no stranger to Dungarvan and in conjunction with Dungarvan Library, we are delighted to welcome him once again to the town. 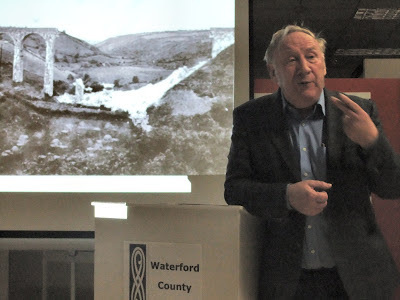 Pat's talk on this occasion will cover the experiences of the Volunteers from Waterford who fought in the GPO, Boland's Mill, the Four Courts, the South Dublin Union and Ashbourne during Easter Week. These were men like Thomas Walsh of Knockanore who was sentenced to death for his part in the fighting. It will also look at Waterford men serving in the British Army who fought against the rebels, men like Joseph Ridgway of Waterford City, the British Army doctor who treated James Connolly after the surrender. The contribution of men from Waterford City and County to the momentous events of Easter Week is largely unknown. This is an opportunity to learn about them and who better to deliver that information than the very colourful Pat McCarthy.